I’m awake early, again. It’s not too bad this time and I quietly upload some of my pictures to the laptop and surf a little. Even the gf seems comfortable to rise today, there’s no cursing and no moaning. We ram more breakfast down our throats then I go outside for a smoke. Whilst there another guest informs me my bike was over last night! The story is a bunch of “youths” were seen around the bike, then later seen picking the bike up. An inspection of the bike shows a scratched bar-end, scratched exhaust and scratched engine-bar. Damn them! I’m livid, yet strangely calm too. The bike is mechanically sound, thanks to the engine-bars, the scratches are only minor and the bike must have gone down gently. I don’t think it was a malicious attack, they probably sat on it then pulled it over getting off. The fact they righted the bike is good. But the little bleeders should not be touching my bike! I wouldn’t even lean against a stranger’s bike or car, let alone sit on it. I’m NOT going to let this spoil my holiday, b####rds. 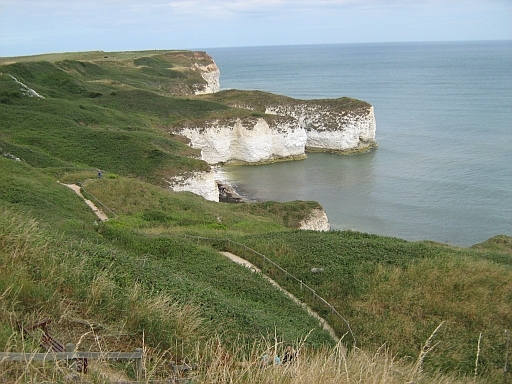 Today we’re taking the bike to Bridlington, Flamborough Head, and Filey. Fortunately as we ride out of town the bike feels just fine, a little better due to not being loaded. It seems the little adventure last night has left no ill effects. The road to Bridlington takes us through the gently rolling and sometimes flat farmland, the weather’s grey but warm and comfortable on the bike. I feel glad to be back on the bike even though I enjoyed my walk yesterday. Bridlington Beach and Promonade, looking very grey. 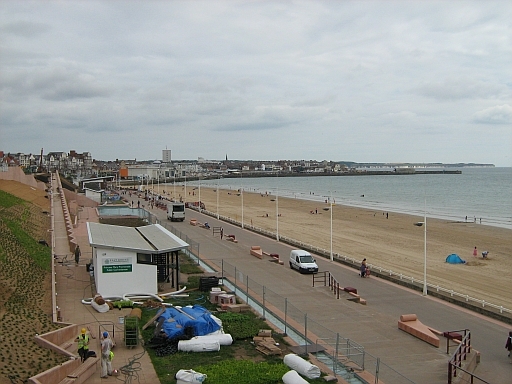 Bridlington is quite similar to Scarborough. It feels a touch smaller but there are all the usual coastal shops and eventually we find a long sandy beach with a promenade. It’s not really beach weather again and with being on the bike we can’t go and sit on the beach anyhow. I park the bike near the beach and we take a 20 minute break to sit and chat and take pictures. Nearby the local tramp smokes quietly and adjusts his luggage. He’s not causing anyone any concern. There’s nothing here for us right now so we head off. Next stop Flamborough Head. A few miles later we’re on a country road following signs. The pay and display car park makes no mention of motorcycles, and if I displayed someone would just steal the ticket from the bike anyhow. We park and wander around, it only takes a few minutes to get the measure of the place so we grab a brew in the café then sit and chat some more. That’s what I like about travelling with the gf. She’s a smart lady with opinions but she’ll listen to mine. We can talk about anything from cold cups of tea to the meaning of life. We seldom agree, but we rarely argue. I feel all manly and clever when I can point how those rocks were formed or why the lighthouse tapers upwards. The only downside is I constantly worry if she’s enjoying herself, if she’s comfortable on the bike or if I’ve woken her too early…again. One morning I expect I’ll be murdered. Next stop Filey. We follow the signs for the beach and find yet another pay and display car park. No-one’s displaying at present, the machines are broken. Although the skies are cloudy, there are breaks here and there and the sun pops out occasionally. We’re determined to get a little beach time. After locking the bike, putting the bike pants into the top box and working out how to carry everything, we take a 10 minute walk to the beach. It’s hard work carrying a helmet and a bag each, the gf’s boots and my knee pads, whilst wearing bike jackets. It’s further than we think to the beach, then when we get there it’s busy. It’s a long curved beach edged by a rock face. We find a spare patch of sand by the rocks and sit there, using the expensive bike jackets as beach towels. I don’t feel very comfortable on my jacket, surrounded by screaming kids and frustrated parents, and the gf doesn’t seem comfortable either. I try to relax a little by digging the sand with my hands and chatting to the gf. The sun pops out for a few minutes which cheers her up, then goes behind the clouds again. After only 20 minutes it looks like it’s going to pour so we give up trying to pretend we’re enjoying ourselves and make the cumbersome trip up the steep path to the bike. 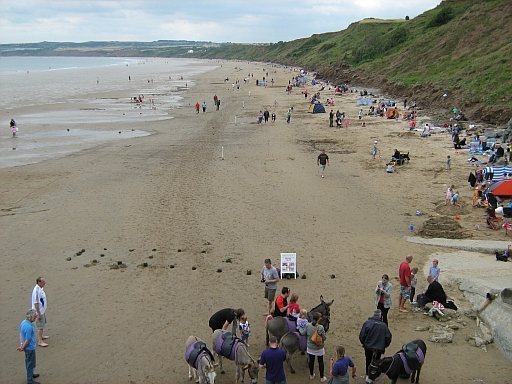 Filey Beach, stretching out right across the bay. We head back to Scarborough and to the Hotel. We sit and talk for a while. I love the bike, I love riding I love being out there and I love being “different” to the car drivers. But it’s a big bind too. Wherever we go, if we wish to leave the bike it means walking round with helmets, gloves, jackets, pants and anything else we’ve got with us that day. Even stopping at a café for refreshments can be a nightmare. If the bike is out of sight you need to unload any luggage, tents and equipment than dump it all in the café. Then you need to undress in tight spaces otherwise you overheat. It’s never comfortable sitting round in heavy pants and waterproof gear. Then after a brief brew and a biscuit the whole affair needs to be done in reverse. We’ve talked of using the car, we’ve both got usable motors. But that’s too dull. We’ve talked of using the car and taking the bike on a trailer, which solves distance issues but not looking around problems. We’ve talked of a trailer for the bike, that can be secured…this is an option. Needless to say, at present we have not found the ideal solution. I love to ride, but I also love to walk around and look. Sometimes the two seem incompatible. It’s our last night in Scarborough so before we go out we tidy up and re-pack most of the gear. We then walk into town for tea. We’ve both been really pigging out with the breakfasts and not holding back with the afternoon snacks, crisps, chocolates and pop either. So in a vain effort to be healthy we go to Subway for a sandwich each. Just how healthy this is is debateable, but it must surely be better than another chippy tea.